Saturday, October 14, 2017 Lagos, Nigeria. Thank you, your excellency, our hardworking, amiable and highly supportive Vice President. As they say, all protocols observed because we have great people in this room today. But there is one man I want to recognize quickly and he we would kindly indulge him because he is a king and you hardly ask him to stand and in this instance, he will indulge me by the powers of the Vice President – Chief Ibitimi Banigo sir. This whole journey started with Chief Banigo when he offered me a job many decades ago. Thank you very much sir. Poverty surrounds us in Africa. Our youth, our youth need jobs, Plenty jobs. Our youth need hope, economic hope, hope for a better tomorrow – plenty hope. In Africa, we have tried different development approaches to deal with these issues of poverty eradication, job creation and creating economic hope for our people. In fact, we know that we have not made much progress. In some areas, we can even say that we have regressed as a continent. Our development partners are not left out, they too have tried to support us. Aid inflow into Africa in the past 10 years, 2006 to 2016, is a whopping half a trillion dollars -$469 billion but we all know that poverty remains unabated in Africa and the basic human development index has not significantly changed. At times, the future looks so bleak that our young ones are forced into migration, they want to go to where they perceive economic opportunity to be and we know that they risk their lives as stoways. They cross the Mediterranean or attempt to cross the Mediterranean on canoes and you know the outcome, most of them die, they don’t even get to the destination. Not only that, we have also seen some of them trust Traffickers, that traffickers will take them to the promised land or the land of milk and honey. But when they get there, they are subjected to the worst form of human degradation, human evil and the so-called economic opportunities that drove their actions – they won’t get to experience it. Some of them end up selling their organs to survive. We saw the Arab spring and what led to it. It was a lesson but unfortunately as a continent I don’t think we learnt so much from that lesson. In Africa, I say to people and we have all heard it today, we have the most precious development resource and that is people – our people are young. Our people are young, talented, energetic, hardworking and extremely enterprising. If you have people who are enterprising, young, energetic and hardworking -let us remind ourselves what potent capacity and opportunities lie in this. I will share three cases. First, Steve Jobs. Steve Jobs is an individual, he founded Apple and today Apple’s market capitalization (the value of their company today) is close to $900 billion, almost a trillion dollars. To put it in context, our country, our foreign reserves is about $35 billion. One company founded by an individual has cash balance of over $300 billion. Bill Gates founded Microsoft and today his market value is close to $600 billion. Cash balances, about a $130 billion. One individual. Jack Ma founded Alibaba, the market value is about $500 billion, cash balance, about $30 billion. So, the point is, all these great men, what they and their companies have in common is that they have ingenuity, they have creativity, they have ideas and most importantly they have passion. But there is one more thing that’s outside their control and that is in my viewpoint why those of you in this room and even entrepreneurs in Africa, our young ones who have great similar ideas, who are very creative. In fact, if not more so than these men. The difference why these men succeeded and why it remains a bit of a challenge is explained by two factors. Vice President, I think for the government of President Buhari and Prof. Yemi Osibanjo and for your legacy, it is a good thing to be recognized as an ease of doing business apostle and driver because if we fix that, we fix the continent. The second factor is the ease of translating ideas to actions, the mechanism, the transmission mechanism that takes ideas to action is extremely important but it is also tied to the operating environment and tied to yourselves and ourselves who have ideas – who must realize that the easiest thing to do is to dream dreams but the most difficult thing is to translate those dreams into action. Our people are creative, hardworking, and extremely enterprising. They say, when I interact with them, that they are experiencing a stifling operating environment. They lack support, they deal with neglect, god-fatherism and the absence of meritocracy. They need a hand-up, they need a little push and for so long we have carried on with a little entitlement mentality that others will develop and solve our problems. These issues and reflections led me to some conclusions and decisions. One, only us will develop Africa and the world should rethink how to engage with and intervene in Africa. If despite the sum of $500 billion spent in the past 10 years, we still remain perpetually dependent and the poverty reduction needle has not been moved significantly. By the way, let us not be shy to say to ourselves that Africa remains largely undeveloped. Hence, Africapitalism is a development model that prioritizes our youth and creates hope for them. It is a bottom up approach to development, an all-inclusive approach that brings development to everyone. One that creates economic empowerment and one that creates hope for the future. Our people have ideas and are ready to work, they want to be given opportunity and a helping hand just like Steve Jobs, Bill gates have in their time. Can we imagine if Steve Jobs was from a different continent, or country? Today he is dead but he has left behind a company that has value of about $800 billion and cash of about $300 billion but he’s dead. If he was in a different environment, it is possible he would have gone to the grave with his ideas and who knows the amount of people in our environment who go to the grave with their ideas and the amount of losses that we as a continent suffer from this. We must realize that and this must lead us to do things in a different way going forward. Another conclusion I came up with is that luck should be democratized and it is not what we keep in our bank account that counts. what matters ultimately is the legacy that we leave behind. It is based on the foregoing that my family through TEF committed a sum $100 million to give hope and opportunities to you young Africans, from all our 54 African countries, male, female, totally sector agnostic, to make sure that your ideas don’t just die in your brains. Everyone needs that support to be able to translate the ideas he or she has into action. The amount is not much, $5000 first to prove your concept and another $5000 to take it to the next level but it can make a difference and that is what we hope to achieve by investing in you. 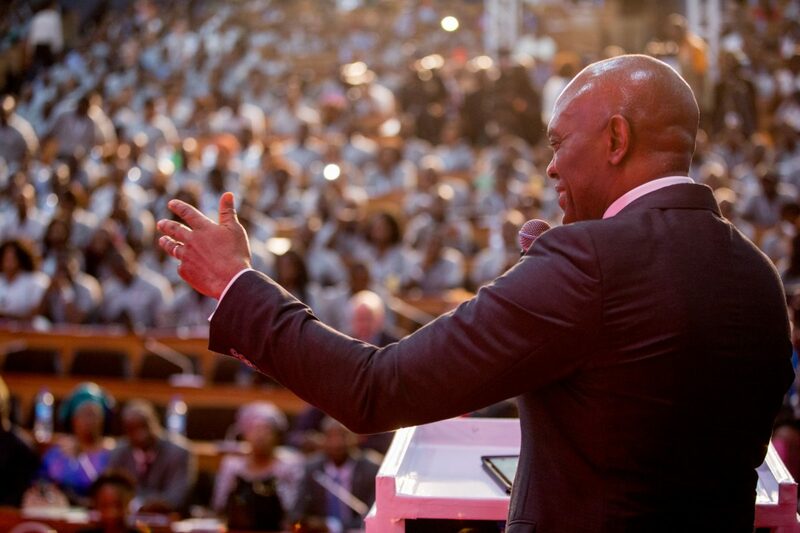 2017 you are the 3rd cohort of the Tony Elumelu Foundation Entrepreneurship programme. So, I say a BIG Congratulations to all 1000 of you. Your role and place however comes with a huge burden. Because your success is not just a personal one, it is and would be for all of Africa and that is a burden, so you owe it to others who don’t have this opportunity. You owe it to the other 97,000 people who didn’t get selected to succeed. And you will contribute your ambitions and visions to addressing some of the challenges that we face in Africa. Those who wear the shoe, knows best where they pinch. We have to, collectively, each according to his capability, join hands in helping to transform Africa. And you and other entrepreneurs must keep passing the baton until there is no more poverty in Africa, until there is no need for our people to search outside Africa for success when indeed success resides in Africa. When there are no more risky crossings of the Mediterranean and where there are no more extremism induced by hopelessness. This is a generational and continental challenge. This is the future we want for Africa. And that is the future that is now in your hands.